These little beauties, that stood for several hundred years in the Munich Town Hall, were owing to their great value, moved to its City Museum in the earlier part of the Twentieth Century. 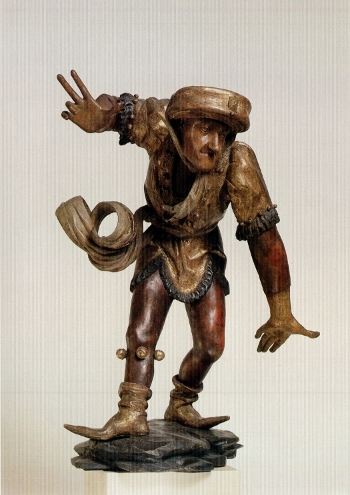 Although at one time it was thought that there had been sixteen figures in all, six having gone lost, this is now disputed. 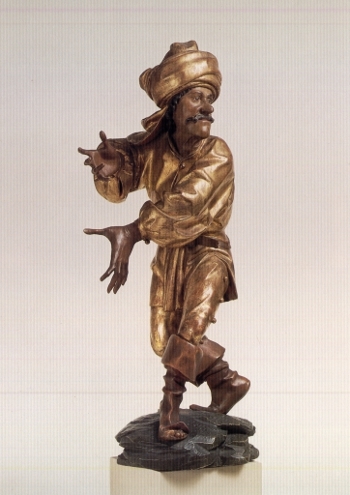 A scholar, formerly a professor at the Technical University at Munich, Dr. G. Krombholz, has reconstructed the Dances, and has even set up a group, to dance them. One can read about it here, and see pictures below. 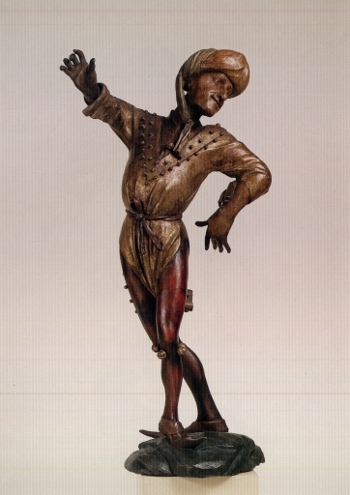 On the Website of the Mathematical-Scientific High School of Munich, known as the Erasmus Grasser Gymanisum (http://www.dasegg.musin.de/), Dr. Brandl-Ziegert has posted a paper on the Morisken Dancers (http://www.dasegg.musin.de/grasser). If you can read German, do - it’s fascinating. 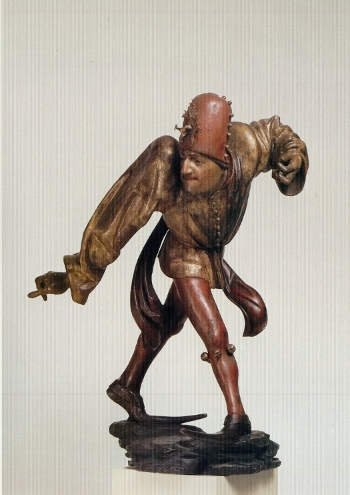 Erasmus Grasser’s "Morisken" figures belong to a style in sculpture, known as Stil der verschränkten Bewegung, attributed to the master Nicolas Gerhaert of Leyden. 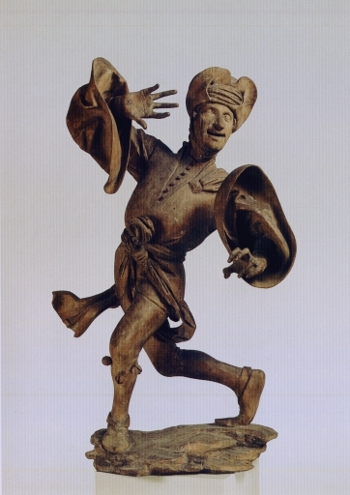 This means the "Style of Rotational Action", or to use the Italian term,Contrapposto. In dancing of course, this is épaulement ! "The legs are crossed one before the other; the torso is bent over them or bent backwards, while twisting sideways at the same time. The shoulders are placed in opposition: if the one be raised, the other will drop. The rotation carries over into the way the head is held - either it follows through the turn of the torso, or else turns backwards. Even the arms take part, whether crook’d, or reaching outwards here there and everywhere. Overall, it is rotational movement, imprinted upon the entire figure (…)." And mark this well ! 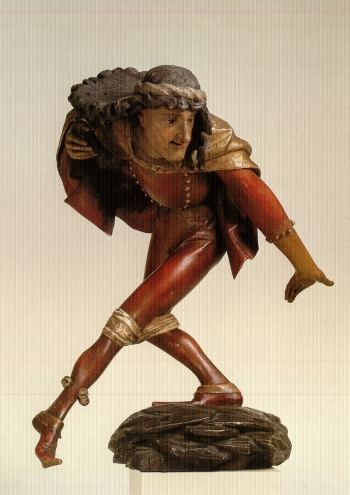 The figures are also fully turned-out, and posed in turned-out positions that are precisely those of the "modern" European classical dancer, full two hundred years before the Reign of the French King to whom the authorship of those positions is, quite wrongly, attributed. The anatomy, the muscle-structure of the individuals Erasmus Grasser portrays - and the figures are almost certainly actual portraits - is that of men who have practised the turnout since early childhood. 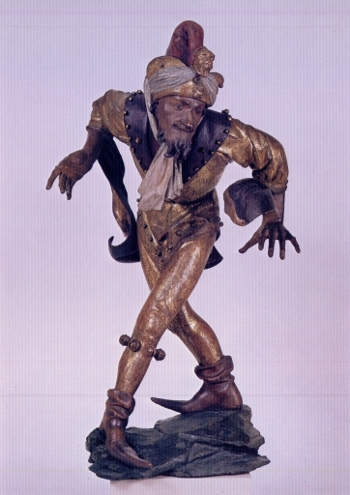 These are, like the itinerant players of the Commedia dell’Arte, Troubadours who happen to be professional dancers, and the fact that they be turned out, may well prove a critical missing link between the great Indian classical dance forms, which are thousands of years old, and Western classical dance. 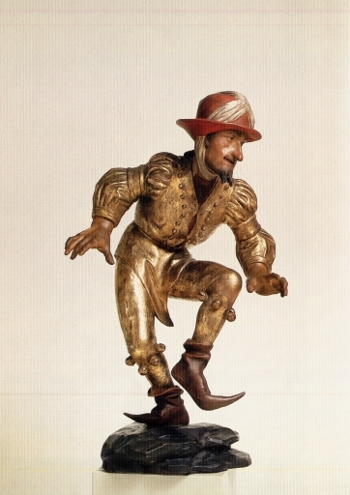 The Morisco dancers are known to have had what we now call "technique", and to have created a sensation by jumping, while other dances of the age involved simply stepping or gliding. As an artist, Erasmus Grasser’s understanding, and ability to portray, the anatomical changes (posture, musculature, full range of motion and potential for using the oppositions) found only in those who have practised the turnout since childhood, is simply uncanny, and unseen in Western Europe until .... Edgar Degas over four hundred years later. 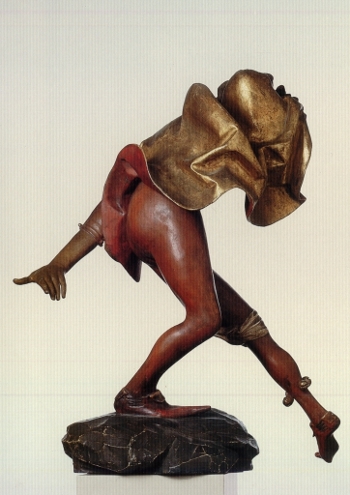 So intent on rendering the remarkable ability to move of the living dancers was Grasser, that he depicted them in tutto tondo (ronde-bosse), and indeed, the wooden figures are as perfect whether viewed from above, from below, or from any angle whether front, or back, or in profile. Though still, they turn, as it were, and never to disadvantage! Not to speak of the figures’ incredible theatricality! The Moriskentanz is, as its name indicates, Spanish in origin, Morisco being the term for Muslims converted to Christianity. 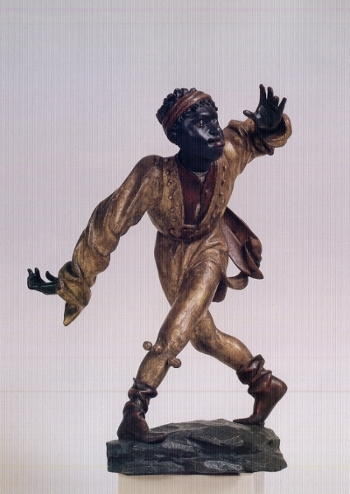 The Morisco Dancers are believed to have reached Southern Germany through Burgundy, perhaps as early as the Fourteenth Century. They doubtless danced at fairs and on Holidays, to the sound of the drum and flute, around a Lady who would, at the end of the dance, give a prize such as an apple or a ring, to perhaps, the wildest and bizarrest of the dancers. 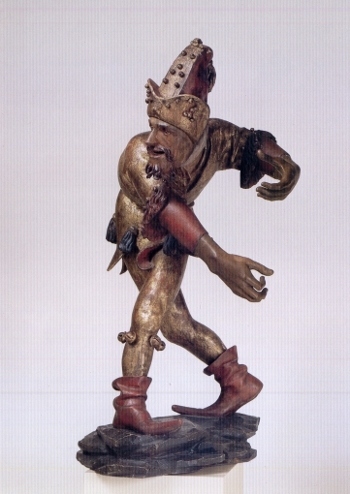 In 1470, under Duke Albrecht IV, Munich built a great new Rathaus (Council House, Town Hall), with a vast ballroom, for which Erasmus Grasser carved the figures. They measure between 61cm and 81.5 cm tall, and were placed six metres above the floor, at the high-point of the columns rising to the ceiling-vaults, which perspective explains why the figures’ head and hand have been carved somewhat large. 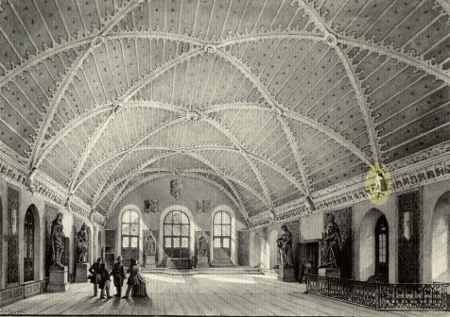 Dr. Brandl believes that the splendid ballroom may have been meant as propaganda to promote Duke Albrecht’s candidacy to head the Holy Roman Empire. Grasser’s work would have been considered an "absolute novelty", a showpiece for Munich as a modern capital, open to the world. It has been mooted that amongst the six putatively "missing" figures there was the Lady with the Apple or Ring, a Piper, a Drummer, and perhaps the planets Mercury, Mars (…). 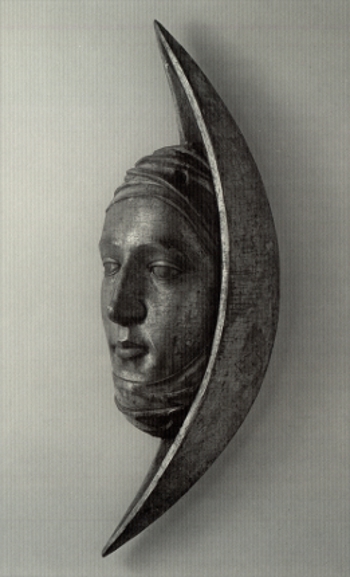 A fair amount is known about Grasser, who was not merely a sculptor, but one of the day’s most noted architects and builders. Thanks to the Grace of God, the Allied bombs of WWII did not destroy all his work. Maria und John the Evangelist for the Church at Pipping. again at Munich, the Choirstalls for the Munich Frauenkirche. at Salzburg in the Nonnberg-Convent, a "Holy Spirit". Aquarelle par Gustav Seeberger, actuellement dans le Stadmuseum de Munich. Depuis leur création et jusqu’en 1928 lorsqu’elles furent transportées au Stadmuseum, les figures étaient placées sur un socle au-dessus et entre chaque fenêtre latérale, à l’endroit exact où aboutit chaque nervure dentelée de la voûte en croisée d’ogives (voûte en trompe l’œil), aboutit sur la frise. Watercolour by Gustav Seeberger, in the Munich Stadmuseum collections. As attested as early as 1568, and until the group was removed to the Stadtmuseum in 1928, each figure stood on a small pedestal, above and between the lateral windows, at exactly the point each of the vault’s ribs ends in the frieze that courses round the entire room. La preuve qu’Erasmus Grasser n’est pas le seul artiste à avoir remarqué l’en-dehors, les positions « academiques » et l’épaulement des Moriskentaenzer. 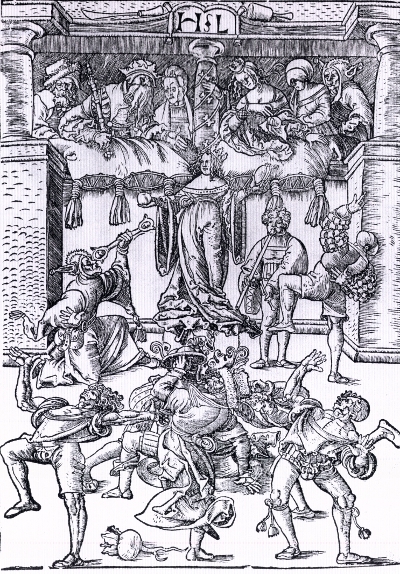 Proof that Erasmus Grasser was not the only artist to have observed the dancers’ en-dehors, "classical positions and épaulement.